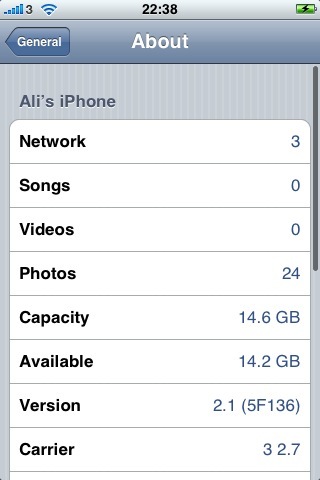 I just upgraded Zainab’s iPhone 2G (purchased from an Apple Store in the US) today from OS version 2.1 to 2.2.1. Originally this iPhone was unlocked using iJailBreak on 1.1.4 and then was jailbroken/unlocked on 2.0/2.1 using PwnageTool. The instructions I read were to upgrade to 2.2.1 using iTunes and then run QuickPwn to jailbreak/unlock the iPhone 2G. Interestingly, after I upgraded to 2.2.1 using iTunes (without any custom IPSW – downloaded the release from Apple) the phone upgrade went without a hitch and the iPhone remained unlocked after the upgrade. That was a surprise. Of course the phone is not jailbroken but I have no interest in that and it seems that once an iPhone 2G is unlocked there are at least some circumstances where it will remain so after a normal upgrade using the official IPSW. So right now she’s using an iPhone 2.G with 2.2.1 OS without any jailbreaks or custom hacks, but with a non AT&T SIM. That’s from my POV ideal and a pleasant surprise. 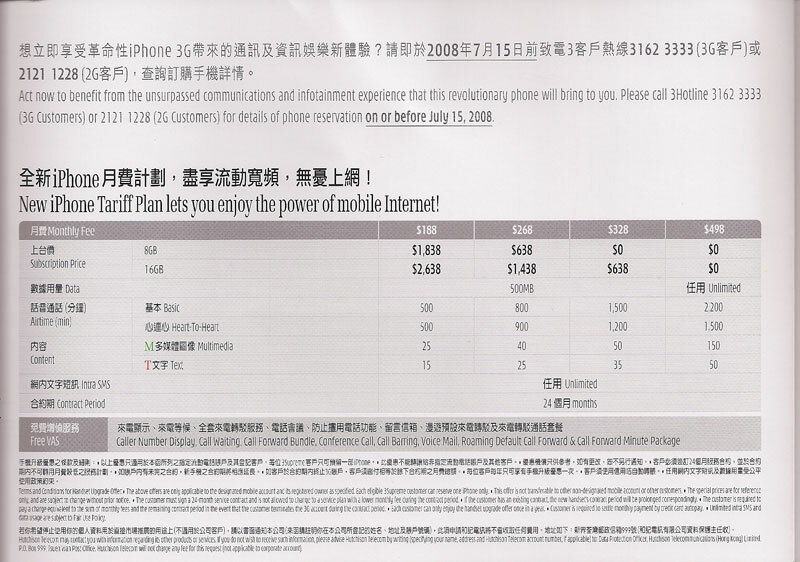 iPhone 3G purchased at the Apple Online Store can be activated with any wireless carrier. Simply insert the SIM from your current phone into iPhone 3G and connect to iTunes 8 to complete activation. They’re not cheap though. The 8GB phone costs HK$5400 (approx US$700) and the 16GB is HK$6200 (approx US$800). I just upgraded to iPhone OS 2.1. Hope that this solves some of the problems I mentioned earlier. UPDATE (13/09/2008): Seems that there’s no improvement in signal quality. On my way to work today, twice the phone dropped into a “No Service” area. This was in areas that most definitely should have had coverage. There are a lot of reports out there that Apple’s 2.0.2 OS update for the iPhone fixes reception issues with 3G. Now I don’t know whether the issues are hardware, firmware, or software related (maybe all? 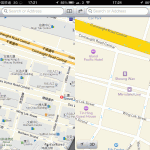 ), but I do know that the 2.0.2 update does not do anything to fix them, at least not for me here in Hong Kong. In a city that has mobile coverage everywhere, including on underground trains, the iPhone sometimes shows 1 bar only for network strength in downtown Hong Kong, where most other phones show full signal strength. In areas where other phones have no problems getting reception, iPhone can show “No Service”. I hope that iPhone OS 2.1 has a solution for these problems. 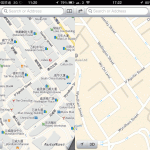 The iPhone is a great computer, but it is lacking as a reliable mobile phone. I came across this limit today while trying to download an application from the iPhone App Store. Apparently, if an application is over 10MB, the iPhone will not allow you to download it over the celluar data network, requiring you to either download over wifi, or via iTunes on your computer. This seems like a pretty brain-dead limit, since 10MB is not a lot of data and they’re hyping up 3G so much as being as fast as broadband. Well, what’s the use if you’re artificially disallowed from downloadling more than 10MB? Chalk one up for the bean counters at AT&T who no doubt convinced Apple to include this “feature”. 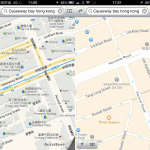 I’ve made a booking with 3 Hong Kong (Hutchison) to get my 16GB Black iPhone 3G this Saturday morning at 11am. I’m looking forward to retiring my four year old Nokia 6600 now.